It was my first film, the culmination of years of planning and research as well as my reason for becoming a documentary filmmaker. “Jim Thompson, Silk King” is the story of an American architect-turned military officer who found himself in Thailand at the end of World War II and stayed. Within four years, he made an industry out of Thai Silk, transforming a local handicraft into an international success that lifted 10,000 or so impoverished weavers into prosperity. At the same time, he put Southeast Asian art on the world map by amassing a superb collection of sculpture, paintings, bronzes and china. A few years later, he rescued Thai vernacular architecture from extinction by designing a landmark house in the Bankrua section of Bangkok. (Today the Jim Thompson House is a museum, the second-most visited tourist destination in the Thai capital.) Thompson’s two decades of non-stop achievement in Thailand ended abruptly in 1967, when he vanished without a trace while walking in the Cameron Highlands of Malaysia. It’s an unsolved mystery that remains potent and troubling nearly fifty years later. 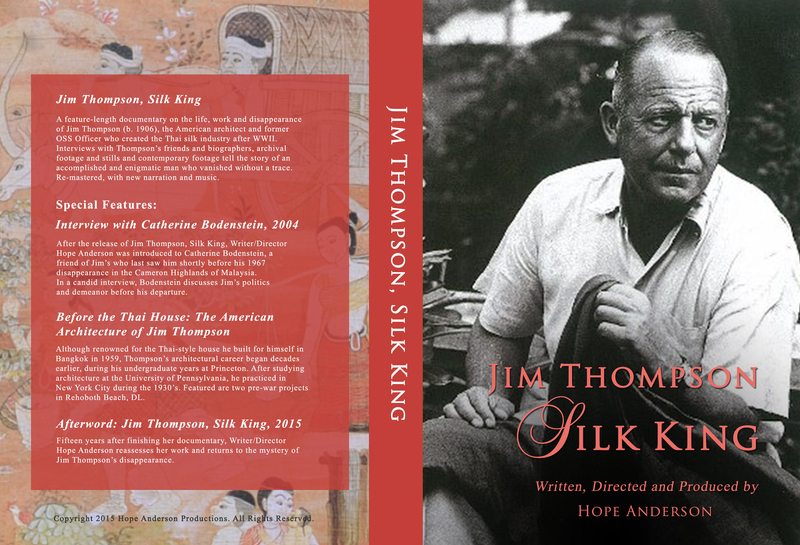 The 2015 edition of “Jim Thompson, Silk King” has new music and narration as well as two new DVD extras, one about Jim Thompson’s pre-war architecture in America and the other about my experiences since finishing the original version in 2001. Also included is my 2004 interview with his friend Catherine Bodenstein, a conversation that sheds considerable light on his disappearance. You are currently reading “Jim Thompson, Silk King,” Newly Remastered with DVD Extras, Is For Sale at Under the Hollywood Sign.